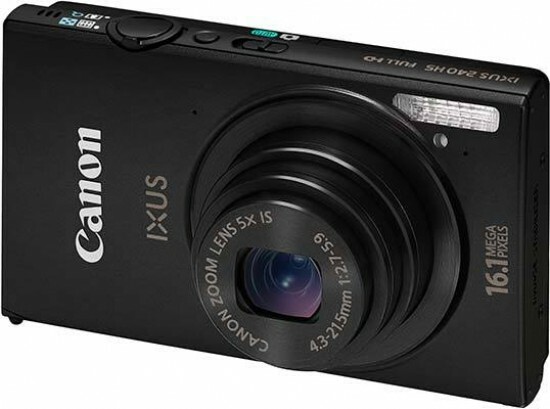 The Canon IXUS 240 HS is an unassuming yet technologically advanced compact camera that hides a lot of features under its typically IXUS-like rectangular exterior. The touchscreen interface isn't the best that we've ever used, but the new wi-fi connectivity options make it easy to share your photos and the IXUS 240 HS certainly delivers much better quality than the average smartphone. The IXUS 240 HS ticks the boxes for anyone wanting a good-looking, slim, metal-bodied compact that packs in all the essentials. These include a 16 megapixel sensor, 5x optical zoom, Full HD video, a smattering of effects filters (including the tilt and shift lens apeing miniature), plus an HDMI output, though the required cable inevitably costs extra. OK, apart from the ability to tweak exposure, alter white balance and play around with colour levels it lacks anything in the way of manual controls, but that much was expected at the outset. We could live without the touchscreen LCD, which is too slow and cumbersome to rival the smartphone's interfaces that it's aspiring to be, but being able to share photos straight from the camera is something that we'd like to see become a lot more widespread. Ultimately the IXUS 240 HS comes most highly recommended to casual photographers looking for a bang up-to-date point and shoot that importantly produces good looking images. If you don’t mind paying a price premium for all the extra bells and whistles, then the Canon IXUS 240 HS makes a great pocket companion.